J has been promising me that if I get a bike, Zurich will completely change. In his words, "there's no better way to see the city. It all looks completely different from the seat of your bike. You'll never get around faster than on a bike. You don't realize how small and close together everything is until you experience Zurich by bike." I believed him, but I wasn't exactly running out to buy a bike. Then he mentioned that he could get a baby seat for his bike and we could go on family bike rides and have picnics. Okay! So I'll get a bike. But I'm extremely picky, so it will have to be one that I love. I've looked at a lot of bikes, but nothing quite falls into that "just right" Lindsey zone. They're either too relaxed, slow, heavy and bubbly, or too sleek, uncomfortably hunchy, sporty and speedy. 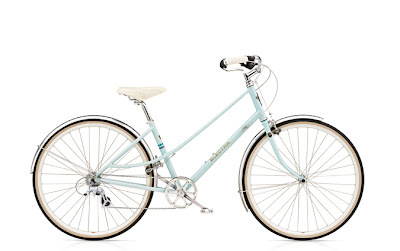 But the Ticino from Electra seems like the perfect bike. Isn't it pretty? I love the mint green color, white seat, wide handlebars and hammered fenders. Swoon! J's bike has hammered fenders. It's a Rivendell Blériot. He bought the frame and then handpicked every single piece attached to it from the wheels to the pedals. I actually got him the handlebars for Christmas one year! :) It took him several years to finish it, but now it's gorgeous (and insured! ;) and he rides it everywhere. Here is the beloved Blériot on the banks of the Limmat last summer. I especially love the white tires. Bike Snob NYC wrote a hilarious review of the Ticino that made me laugh out loud. He mercilessly made fun of people who know nothing about bikes and choose one mainly because it's pretty. (Yep, that's me!) And then he got around to the point, which is that he had to admit that the Ticino is lightweight, fun to ride, fast enough and comfortable. Four stars in my book! 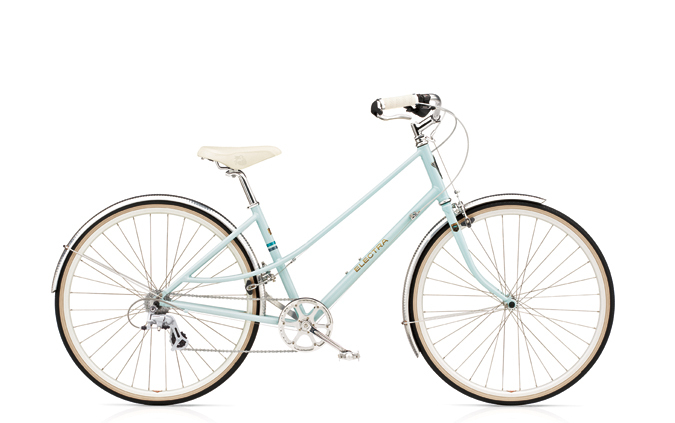 Maybe if it stops raining this week, I'll take Coco on a walk to the bike shop down Seefeldstrasse and see if they have it in stock. Do you have a bike for commuting or just for fun? What do you love about cycling where you live? Oooh! Just "built" a really pretty bike on their site. Thanks for the tip! When did you settle down?